The Charlottesville City Council is a five-member elected body that serves as City's legislative and governing body. Each member is elected at-large and serves a four-year term. Elections of City Council members are held in November of odd-numbered years for staggered terms. With the seating of a new Council, the Council members elect the Mayor and Vice Mayor for two-year terms. The Mayor presides over meetings, calls special meetings, makes some appointments to advisory boards and serves as the ceremonial head of government. The Vice Mayor substitutes whenever the Mayor is unavailable. While the Mayor has no more power than any other Councilor, the position carries with it the ability to set the agenda. That means the Mayor can control how the meeting flows. Council guides policy decisions concerning city planning and finances, human development, public safety and justice, public utilities, and transportation. Council has the power to pass ordinances, levy taxes, collect revenues, adopt a budget, make appropriations, issue bonds, borrow money, and provide for the payment of public debts. City Council appoints four top City staff positions: City Manager, the Director of Finance, the City Assessor, and the Clerk of the Council. Council holds public meetings on the first and third Monday of each month. If one of those dates falls on a holiday, Council will meet on the Tuesday following the holiday. Meetings are held in City Council Chambers in City Hall and are televised on Cable Channel 10, as well as streamed online. Council occasionally holds additional work sessions in CitySpace. Traditionally, regular meetings of City Council begin at 7:00 PM in City Council Chambers. They begin with the pledge of allegiance, followed by any awards, recognitions or announcements that need to be made. Then, Council will invite the public up to speak during for up to three minutes on any item that is not on the agenda. Depending on who has been Mayor, this period either last until everyone had their chance to speak or until 7:35 PM. Up until February 2016, councilors had the opportunity to respond to comments. New rules made then prevented them from doing so and others changes were made as well. These changes have been cited by many as leading to tension in City Council Chambers. Next, the Council will consider the consent agenda, which is a list of resolutions and ordinances that Council has agreed in advance to approve. Beginning in 2003, Council moved this section to the front of the agenda rather than at the conclusion of the meeting. Any item pulled from the agenda, however, will be deferred until after all regular items have been heard. After the consent agenda is passed, Council will hear any number of resolutions, ordinances or reports. Public hearings are required for certain items to move forward. At the conclusion of the meeting, the public is offered one more chance to make a public comment. Then, Councilors are asked if they have any other business they'd like to bring up. After that business has been discussed, the Mayor will call for Council to adjourn. Council frequently holds strategic retreats to address the City Council vision. While no votes are taken at these meetings, staff acts on priorities identified at these meetings. Since 2010, Council also holds occasional town hall meetings in the community. The current configuration of a 5-member City Council has been in place since the 1920's according to City Attorney Craig Brown. Before then there were 12 alderman and a Mayor. Other attempts have been made to change the system. A group called the Citizens Committee to Study Council Changes had reviewed possible changes to how City Council was elected. Shall the form of City Council be changed from the present Council of five members elected by the voters of the entire city to a Council composed of seven members, with four members elected from our four separate wards and three members elected by the voters of the entire city? In 2004, an Election Task Force was appointed to study changing council elections to November from May. Councilor Rob Schilling had wanted to try to expand the scope to also include expansion to a ward system, but was voted down 4-1. Schilling said a system of four members elected by ward and 3 elected at-large would be representative of the city. Charlottesville switched from May to November City Council elections in 2007. Councilors elected in May 2004 have shortened terms that end December 2007 (instead of June 2008). Councilors elected in May 2006 have shortened terms that end in December 2009 (instead of June 2010). The first new Councilors to be elected in November were Holly Edwards and Satyendra Huja; incumbent David E. Brown, first elected May 4, 2004, was re-elected. see also: 2007 election. Julian Taliaferro and Dave Norris were the last new Councilors elected in May to serve on the City Council. ↑ Web. Walker selected as Charlottesville’s next Mayor after public discussion, Sean Tubbs, News Article, Charlottesville Tomorrow, January 3, 2018, retrieved January 4, 2018. ↑ Web. City Council OKs revisions to meeting procedure, Chris Suarez, News Article, Charlottesville Tomorrow, February 16, 2016, retrieved January 18, 2018. ↑ Web. Public, Councilors seek changes to Council meeting rules, Sean Tubbs, News Article, Charlottesville Tomorrow, January 17, 2018, retrieved January 18, 2018. ↑ Web. Charlottesville City Council meeting minutes, .pdf, Council Chambers, City of Charlottesville, May 5, 2003. ↑ Web. Council meeting disruption sparks closed session, delay, Chris Suarez, Daily Progress, World Media Enterprises, April 2, 2018, retrieved April 9, 2018. ↑ Web. Council chambers cleared after Unite the Right organizer delays meeting, Desiree Montilla, News Article, CBS19 News, April 3m 2018, retrieved April 9, 2018. ↑ Web. Commotion Erupts as Unite the Right Organizer Delays Council Meeting, Victoria Wresilo, News Article, WVIR NBC29, Charlottesville, Virginia, April 3, 2018, retrieved April 9, 2018. ↑ Web. Charlottesville City Council Minutes, November 3-5, 2006, Jeanne Cox, City Council Minutes, City of Charlottesville, retrieved November 13, 2017. ↑ Web. Charlottesville City Council identifies new priorities in two-day retreat, Brian Wheeler, Charlottesville Tomorrow, retrieved November 5, 2015. ↑ Web. Charlottesville City Council meeting minutes, .pdf, Council Chambers, City of Charlottesville, September 5-6, 2008. ↑ Web. Council discusses city vision at retreat, Sean Tubbs, Charlottesville Tomorrow, February 4, 2012, retrieved January 18, 2018. ↑ Web. Charlottesville City Council meeting minutes, .pdf, Council Chambers, City of Charlottesville, February 3, 2012. ↑ Web. Council debates ‘new reality’ at retreat, Charlottesville Tomorrow, September 2012, retrieved November 5, 2015. ↑ Web. City Council Retreat - Informal Notes, Paige Barfield, City Council Minutes, City of Charlottesville, retrieved November 13, 2017. ↑ Web. Council launches new strategic planning process at retreat, Sean Tubbs, Charlottesville Tomorrow, October 26, 2014, retrieved November 5, 2015. ↑ Web. Council tweaks operating procedures at Morven retreat, Sean Tubbs, Charlottesville Tomorrow, August 29, 2014, retrieved November 10, 2015. ↑ Web. City Council to Consider Revised Council Procedures, City of Charlottesville, Press Release, City of Charlottesville, February 10, 2016, retrieved December 29, 2016. ↑ Web. Winning the lottery: City Council’s new commenting policy draws controversy, Samantha Baars, News Article, C-Ville Weekly, February 16 2016, retrieved December 29, 2016. ↑ Web. 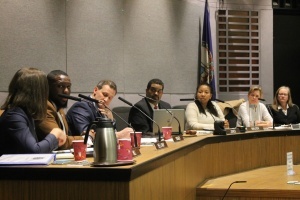 City Council OKs revisions to meeting procedure, Sean Tubbs, Daily Progress, World Media Enterprises, February 17, 2016, retrieved December 29, 2016. ↑ Web. City Council - New Public Comment Procedures, Press Release, City of Charlottesville, retrieved December 31, 2016. ↑ Web. Staff report on Council meeting changes from February 5, 2018, City of Charlottesville, retrieved June 10, 2018. ↑ E-mail. City Attorney Craig Brown, City of Charlottesville. "school board ward system." Message to Sean Tubbs, Charlottesville Tomorrow. February 3, 2015. ↑ Print: McCue Bill Would Alter Election of Councilmen, Don Devore, Daily Progress, Lindsay family January 23, 1960, Page . ↑ Print: Change in Election Meets Disapproval, , Daily Progress, Lindsay family January 5, 1960, Page . ↑ Print: Council Candidates Ask Vote on Charter Changes, Staff Reports, Daily Progress, Lindsay family January 30, 1960, Page . ↑ Web. Charlottesville City Council meeting minutes, .pdf, Council Chambers, City of Charlottesville, November 16, 1981. ↑ Web. Charlottesville City Council meeting minutes, .pdf, Council Chambers, City of Charlottesville, March 1, 1982. ↑ Web. Letter from Booker Reaves to Circuit Court Clerk regarding advisoryr referendum, Booker Reaves, Letter, Charlottesville Electoral Board, May 6, 1982, retrieved October 12, 2017. ↑ Web. Poor and ignored? Schilling makes the case, Lisa Provence, The Hook, Better Publications LLC, March 18, 2014, retrieved February 3, 2015. Print. March 18, 2014 , 311, . ↑ Web. How might Charlottesville be governed differently in the future?, Sean Tubbs, News Article, Charlottesville Tomorrow, February 28, 2018, retrieved March 5, 2018. ↑ Web. City Councilor Wes Bellamy talks Aug. 11 and 12, local politics with Jefferson Society, Geremia Di Maro, News Article, Cavalier Daily, April 3, 2018, retrieved April 9, 2018. ↑ Web. Student liaison to council hopes to increase UVa-city engagement, Chris Suarez, Daily Progress, World Media Enterprises, November 30, 2015, retrieved December 1, 2015. ↑ Web. Charlottesville City Council meeting minutes, .pdf, Council Chambers, City of Charlottesville, July 21, 2003.